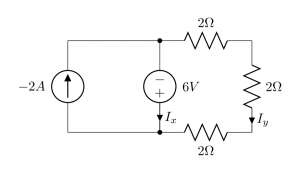 Electrical Circuit Contest – Win $10! sir , can u give some information about electrical circuit contest.... . how can i participate? It is over for now. Hopefully, we will have a new contest soon. When is the next contest held sir (Date and year)? If Iy is -1A then Ix+Iy-2A=0 shouldn't give Ix=3A? A negative sign was missing from the KCL. It is corrected now. Hey, very simple. From the diagram, Ix+Iy=-2A (Assume the bottom node like you said. Ix and Iy are incoming currents. And outgoing current is -2A. As per KCL, sum of incoming currents equals sum of outgoing currents). Keep this as one equation. Next to loop 2, apply KVL. You will get (-2-2-2)ix-6=0. 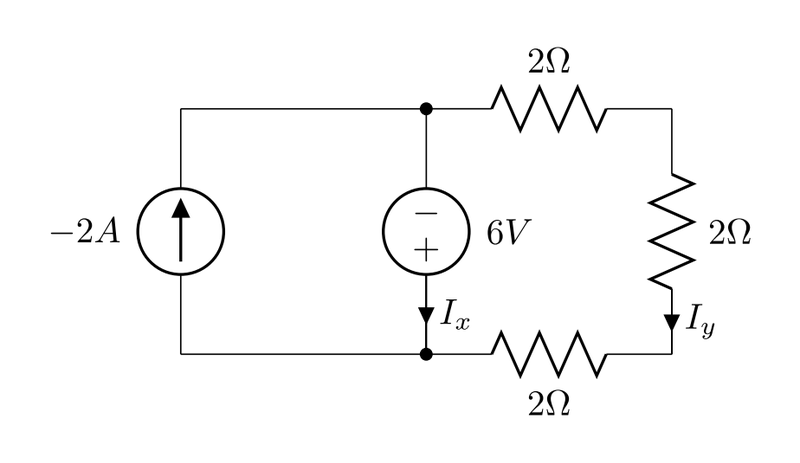 This gives -1A current in clockwise direction. Apply this value in first equation. You will get Iy=-1A.